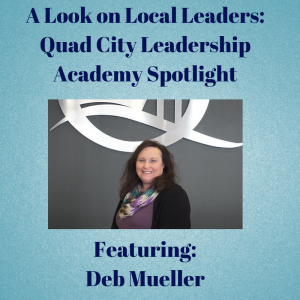 Today, we hear from QCLA Graduate of 2017, Deb Mueller about her experience participating in the Quad City Leadership Academy. Where were you when you started QCLA and where are you now? My employer at the time was, US Bank, had always been supportive of QCLA and agreed to allow me to attend while paying the cost. I recently became the Membership Manager at the Quad Cities Chamber. How did your QCLA experience impact you? The class was amazing! I was surrounded by other classmates from all different backgrounds, races and genders and we all held completely different positions within the QC Business community. We came together to work on a project that was very important to us. Ginny gave us some suggestions but empowered and supported us with our choice. We made visits to several businesses in the QCA such as Exelon, Iowa American Water, MidAmerican Energy, Mississippi Valley Regional Blood Center and Augustana College. We were able to listen to great leaders tell their stories of how they got to where they are. It was very inspiring. They didn’t all have a golden spoon and had to work hard to get where they were. These were not people I would have met in this setting telling their stories otherwise. I may not have crossed paths with them at all if not for being part of QCLA. Why would you encourage someone to sign up for this program? It is a great way to enhance leadership skills, learn from other leaders in the Quad Cities and grow as a person. Personally, it has allowed me to be a better employee as well as a better member of our community. Being part of the Quad City Leadership Academy is something I will never forget. This is a true testament of the impact it has had on my life. I would highly recommend anyone given the opportunity to go through this class jump at the chance! You will not be disappointed. Thank you, Deb, for sharing your experience with the Quad City Leadership Academy! Want to know more about QCLA or sign up? Call the Marketing Office at 563-359-1099.